Fun-loving and easygoing – that’s Tyler Stratton. These traits helped him overcome many hurdles, and made him a favorite patient of his doctor and the staff at Akron Children’s Hospital Mahoning Valley. Born with a congenital shortening in his left femur, or thighbone, Tyler had a 5-centimeter difference in his leg lengths. To correct the issue, Tyler underwent multiple surgeries at Akron Children’s to lengthen the shorter leg. A complex process, the lengthening also put him at a high-risk for complications. Things were going well – until Tyler fell and broke his femur, requiring more surgery to fix the fracture. 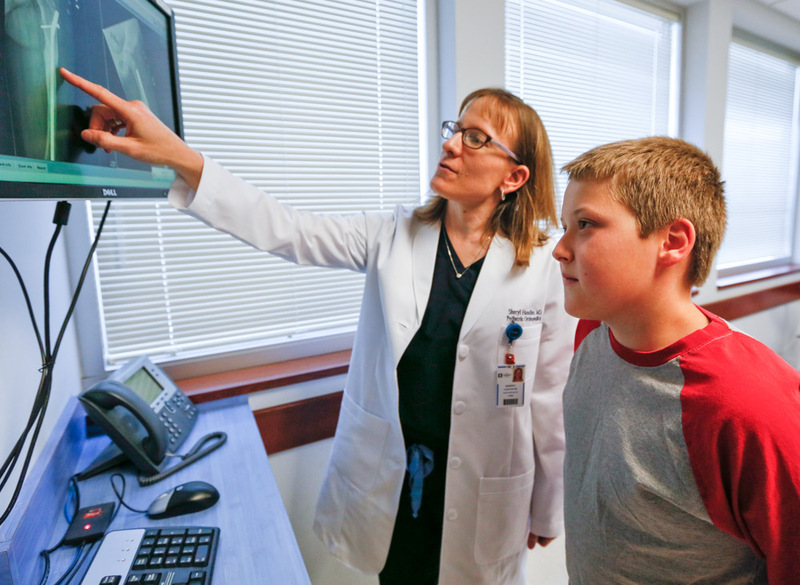 A month later, Dr. Sheryl Handler, director of orthopedics at Akron Children’s Hospital Mahoning Valley, and her team discovered a dire situation – a serious infection of the leg, causing the plate and screws placed during his last surgery to pull away from the bone. A key member of that team was Dr. Kerwyn Jones, chairman of Akron Children’s department of orthopedics. Dr. Handler also consulted with a pediatric orthopedic expert in St. Louis and a pediatric orthopedic equipment manufacturer. Together, they developed a plan to save Tyler’s leg. After Drs. Handler and Jones removed the infected bone and the screws and plates from Tyler’s leg, they inserted a rod into the femur that ran from his hip to his knee to stabilize the bone and help it heal. This immediate action saved Tyler’s leg. Through this difficult situation, Tyler’s mom, Amy Stratton, found comfort and confidence in Dr. Handler. Tyler’s recovery from surgery started with a 7-day hospital stay that overlapped with his birthday. The staff made sure it was a birthday he’d always remember. A year later, Tyler’s recovery continues. He’s back to running around, riding bikes and doing the things that boys like to do. His mom says the rod in his leg helped him get his life back. “He’s still healing. But he’s not tied to crutches,” said Amy. Tune in to the 8th annual Miracles & Promises Radiothon, broadcast live from Akron Children’s Beeghly campus on Mix 98.9 or 570 WKBN Sept. 21 – 23, to hear more of Tyler’s story. Visit www.miraclesandpromises.org to support the radiothon.